Help Us Make the 2018 Festival a Success! There is a lot that YOU and your family can to do make this year’s festival a success for the parish. Please consider helping out in one of the five ways below! Like last year, we will have live entertainment each night. Saturday Night is Saffire Express and Sunday night is Bluefish. 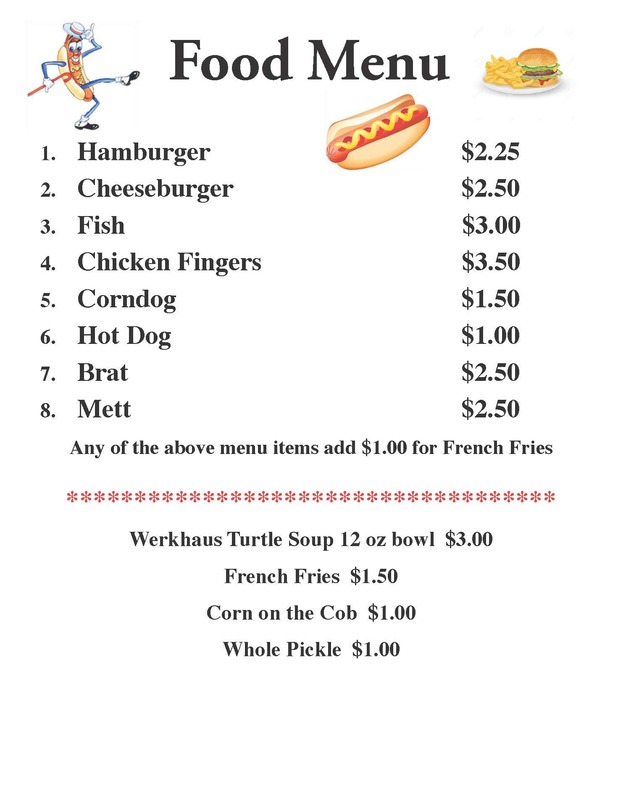 We will have lots of delicious food and good beer as well. We hope you will plan on coming. If you have any questions about the festival or need more tickets, please call the rectory at 921-0328 between 9am and 3:30pm. If you would like to help at the festival, please call Theresa Murphy at 921-0266, or Click Here. Variety Booth: Help the teachers to collect nearly 750 items needed to stock the Variety Pull-Down Booth! Handcrafted items and NEW items are great, as well as: newly purchased plush animals, toys, figurines, small household items and holiday items, etc. Be creative! They are also accepting cash donations to purchase items. NEW items can be dropped off at the rectory or call 921-0328 between 9am – 3:30pm for pickups. Thank you for supporting St. Lawrence Parish and School. Basket Bonanza Booth: This booth has been very successful in the past and with your help we hope to carry on the tradition. If you would like to donate a themed basket or items for use, gift certificates or monetary gifts; these can be brought to the rectory Monday – Friday, 9am – 3:30pm. Consider investing in a booth sponsorship. Your name, the name of your business or in memory of a loved one will be on display the entire festival weekend. 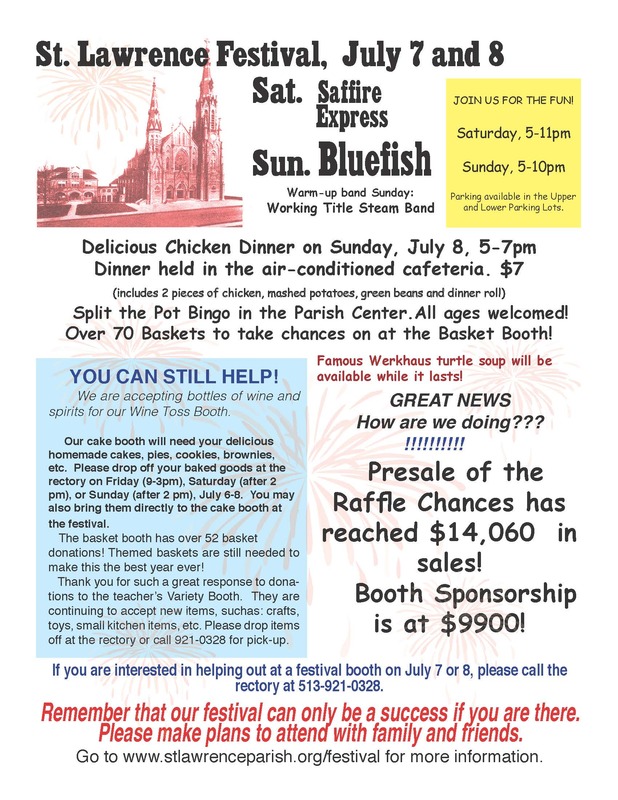 The booth sponsorships cover the rising cost of the bands, booth rentals, printing, state rental and various other expenses that the parish incurs preparing for the festival. Click here Page 1 and Page 2 to view our current sponsors. The Major Award will be drawn on Sunday, July 8th at 10pm. So, please keep up the good work of buying and selling tickets. The Major Award is the largest source of income for the festival. Its success is vital! Tickets can be purchased or dropped off at the Major Award Booth throughout the festival. Consider volunteering to back cakes, cookies, brownies, etc. for our renowned cake booth. #5 Come to the Festival! Please make plans to attend with your family, and tell your friends and coworkers about the festival!